Engraved Small Boxed Compass with Beveled Glass Lid by Stanley London at Zvejo Tribuna. MPN: BeveledGlasslidCompEngraved. Hurry! Limited time offer. Offer valid only while supplies last. The Stanley London® Small Boxed Compass is a handsome reproduction of an antique brass gimbaled compass in a beautiful brass-inlaid hardwood box. The Stanley London® Small Boxed Compass is a handsome reproduction of an antique brass gimbaled compass in a beautiful brass-inlaid hardwood box. The 2 3/4-inch (7 cm) diameter compass is fully gimbaled with a solid brass gimbal set. 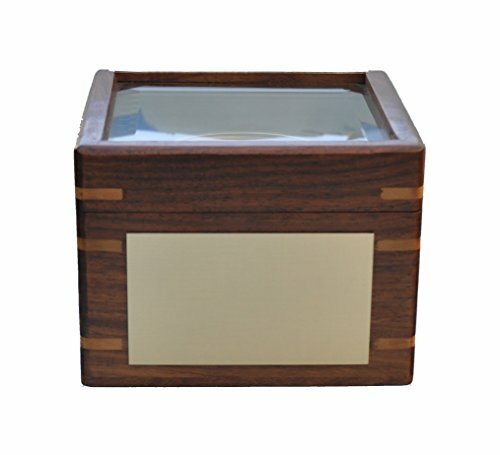 The lid of the hardwood case is inset with beveled glass so the compass can be viewed with the lid closed, making this a beautiful addition to a nautical collection or executive's desk. The gimbaled compass is protected by a second glass cover. The hardwood case is 4 5/8 inches (11.7 cm) square and 3 1/4 inches (8.9 cm) tall, and the compass weighs 1 3/4 pounds (800 grams). The brass plaque mounted on the front of the compass is engraved with your custom text. The brass plaque mounted on the front of the compass is custom cut to fit your engraved text. If you have any questions about this product by Stanley London, contact us by completing and submitting the form below. If you are looking for a specif part number, please include it with your message.